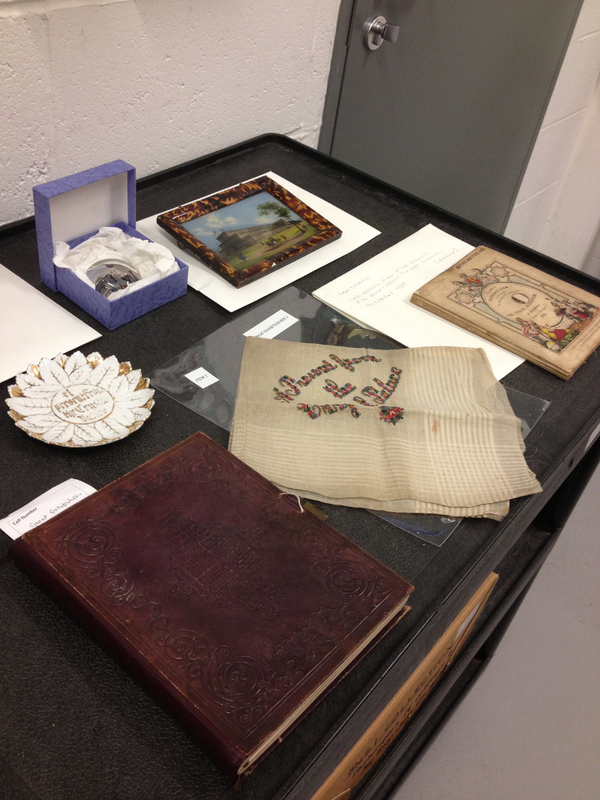 As part of last weekend’s national Heritage Open Days event, MERL and Special Collections offered ‘behind the scenes’ tours, from a look round the Victorian biscuit baron home to a visit to the special collections and object stores. 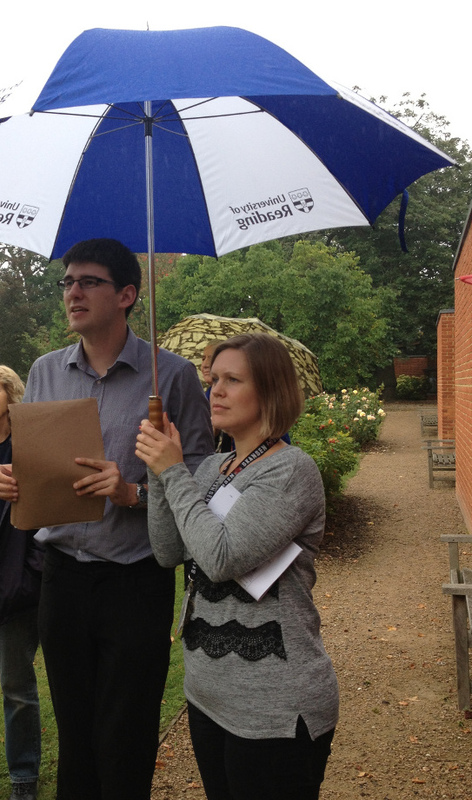 The tours began outside; the light drizzle didn’t seem to put anyone off, and large umbrellas allowed them to take a look at the building that forms the foundations of the current MERL/Special Collections site: the Grade II listed building originally known as East Thorpe. East Thorpe, which now forms the central part of the current site, was the home of Sir Alfred Palmer of the Huntley and Palmers biscuit company. East Thorpe was designed and built by the architect Alfred Waterhouse between 1880 and 1882, and Alfred Palmer lived there with his family following his marriage. 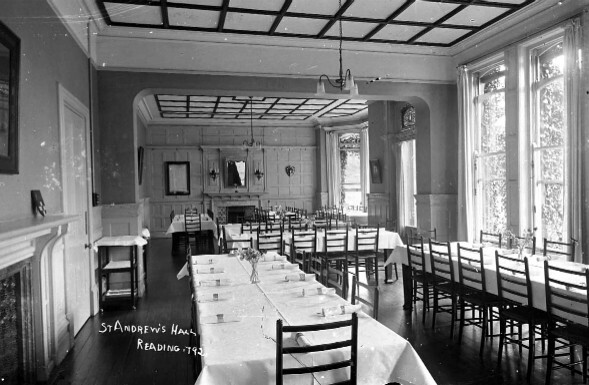 This building was later acquired by the University, and was extended to form St. Andrews Hall, a University hall of residence. The hall believed to be the first English hall of residence outside of London to provide female-only accommodation. It closed in 2001. After a look at the former stables from the front (now open access library rooms), tour group trooped inside to see the former entrance hall, morning room, drawing room and dining room. These rooms are now the Special Collections Reading Room, but you can see remnants of their former use in their exquisitely tiled fireplaces and the serving hatch to the former kitchen. On Thursday and Friday, the tour groups then headed down the hallway and into our rare book and archive store, where archivist Nancy Fulford had pulled out a selection of some of our more interesting items. The groups got to peek at some of our Great Exhibition Collection, peer over our Book of Hours and first edition of Hooke’s Micrographia and look at some of our new acquisitions. On Friday and Saturday, groups were led into the object store of the Museum of English Rural Life, where they got to see the thousands of items that explore rural life, from farming to crafts to technology. If you missed Heritage Open Days, you can still book onto a tour of the museum on Saturdays, Sundays and Wednesdays. We’ll also be offering Victorian Christmas guided tours in December -taking you back to join the Palmer family and their staff in celebrating Christmas 1882. Keep an eye on our What’s On pages for more information. In the meantime, if you’re interested in the history of the buildings, you can visit our online exhibition. What happens when you put on gloves? Can you handle clasps, ties or other delicate items? Can you turn a page? Are you clumsier? Can you feel things through your gloves? When people picture librarians and archivists with fragile material, they often assume that cotton white gloves come with the territory. Despite what you may see on some television programmes, many libraries and archives recommend not using gloves on a regular basis. Here at Reading Special Collections, we only use gloves for very specific types of material, like glass negatives, that would be damaged by fingers – and usually we recommend latex or nitrile gloves rather than white cotton ones. Why don’t we use white cotton gloves? Gloves reduce your dexterity. In other words, they can make you clumsier. Gloves, particularly white cotton ones, aren’t very fitted. You can’t grip things as well or as carefully with them on as you can with bare fingertips, which means it’s much easier to tear a page accidentally when you’re wearing gloves. Gloves get dirty. 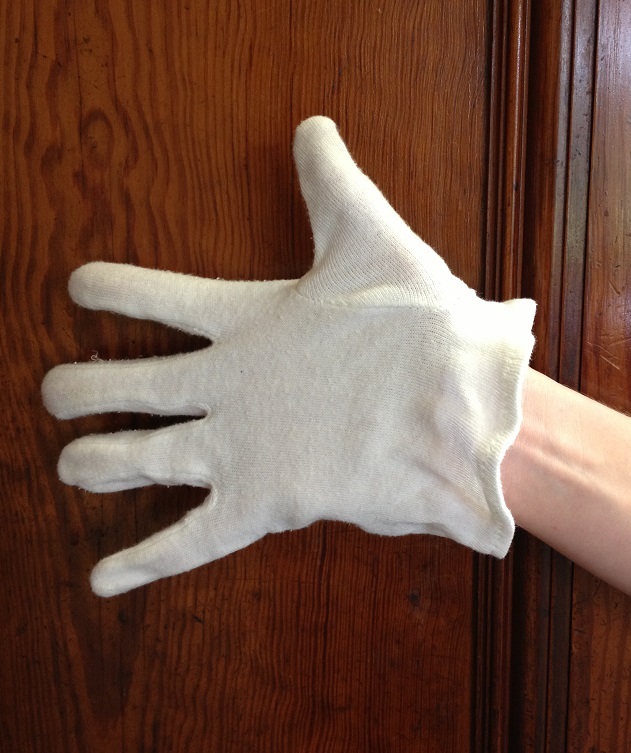 White cotton gloves aren’t sterile, and their absorbent fabric surface picks up lots of dirt and debris. As our visitors know, old manuscripts and books can get your hands filthy! When all this dirt ends up on gloves, it can transfer to other books and manuscripts and cause damage. Gloves stop you from learning about an item. Many scholars – and indeed our staff – need to know about an item’s physical qualities. The feel of the paper can tell you more about its history and production, for example. This type of engagement with the physical object becomes impossible when you’re wearing cotton gloves. So what do we recommend instead? Handle our manuscripts and rare books with clean, dry hands. We might ask you to use gloves for certain items in our collections that react more strongly to dirt or human oils – some glass negatives, art or other delicate objects, for example. But on the whole, if you are clean and careful in your handling, your skin won’t cause any significant damage. This short video from the British Library shows how NOT to handle a manuscript with gloves. Interested in learning more? ‘Misperceptions about White Gloves’ is a great starting point from the IFLA International Preservation News journal. You can also take a look at the National Archives and British Library policies on gloves use.